Swimming with dolphins? Meet those who take care of them! 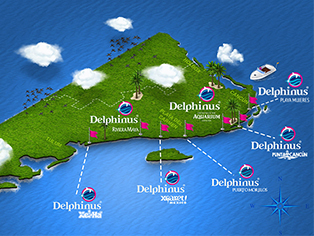 The animal care specialists at Delphinus are experts in biology, veterinary and comprehensive care of marine mammals. No one understands better than they do certain dolphin behaviors. They know the best techniques needed to keep Our Dolphins Family in top condition. Swimming with dolphins requires certain conditions: a natural habitat, happy dolphins in good health, high quality care and, of course, the expertise of Animal Care Specialists. Discover how amazing and important they are to the Delphinus family! How to become an animal care specialist? 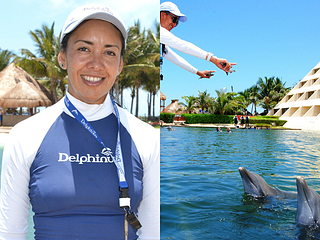 Our animal care specialists at Delphinus became real experts thanks to the love and passion they have for animals. Many of them have different careers but their vocation to be close to dolphins led them to start as apprentices until being certified. It’s important to keep in mind that dolphin training is accredited by IMATA International Marine Animal Trainer’s Association, a group of experts composed of truly active people in the field of marine life, scientists, animal behavioral specialists and animal rights activists. IMATA is dedicated to providing the best management techniques to benefit marine animals and foresting communication between professionals that serve marine animal science through training, research, conservation and education. However, it’s important to know that in order to get there you must know the procedures, resources, operations and ways of working, especially because this environment is constantly changing. Now that you know why it is important to have highly trained specialists with the knowledge and expertise necessary to deal with different marine species, you will understand their true value when one of them is supervising your experience of swimming with dolphins. An animal care specialist can give you the information you require before swimming with dolphins. They will tell you everything you need to know and under their supervision you will enjoy a unique moment. If you want to swim with dolphins and turn it into a special experience, learn about the different interactions that exist and imagine yourself with one of the most intelligent mammals of the ocean, choose the one that catches your attention and book right now to have the time of your life.